It's official. The highest waterfall in the world and Venezuela's greatest tourist attraction, Angel Falls, has been announced as one of the 28 finalists in a competition to find the New Seven Wonders of Nature. The final 28 were unveiled on 21 July in Zurich by the Swiss-based non-profit organization the New7Wonders Foundation and voting for the New 7Wonders is underway. Angel Falls, or Salto Angel as it is known in Venezuela, was chosen from among 77 natural wonders that had been whittled down from 261 suggested global landmarks following an online vote and a final decision by a panel of experts. Led by the ex-director general of UNESCO, Federico Mayor Zaragoza, the panel made their selection using criteria such as natural beauty, ecological importance, historical importance and geographical location, to have an equal distribution by continent. Cascading spectacularly from the top of flat-topped mountain Auyan-tepui into the Churun River below, Angel Falls is a worthy candidate for the New Seven Wonders of Nature. Located in remote jungle more than 100 km from the nearest town, Angel Falls drops 979 metres from the top of the mountain - with an uninterrupted drop of 807 metres - and is 19 times higher than Niagara Falls. 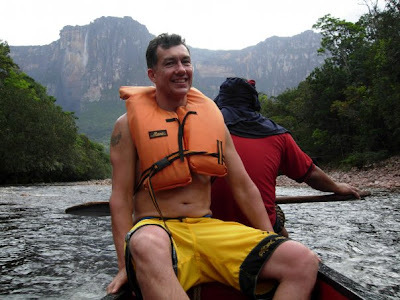 The only way to get to the base of the falls is by navigating the Carrao and Churun rivers in a two day trip by dugout canoe from the jungle camp of Canaima. Other succesful finalists include The Amazon rainforest, Australia's Great Barrier Reef, Ecuador's Galapagos Islands, The Grand Canyon in the USA, Mount Kilimanjaro in Africa and the Dead Sea. In the final phase of the competition, the public will now have the chance to select their top seven from the list of 28 natural wonders. The succesful seven will be announced in 2011. The man who came up with the idea, Swiss-Canadian filmmaker and aviator Bernard Weber, says his goal is to raise awareness about the natural treasures of the planet and the need to conserve them. The foundation's slogan is: "If we want to save anything, we first need to truly appreciate it." Critics have questioned the fact that some governments have led high-profile media campaigns to get people to vote for their natural wonders, given the clear tourism benefits that this kind of competition can generate. The United Nations Educational, Scientific and Cultural Organization, UNESCO, which has its own list of Cultural and Natural Heritage Sights, has definitely not welcomed the initiative saying that the list of the New Seven Wonders finalists "will be the result of a private undertaking, reflecting only the opinions of those with access to the Internet and not the entire world." And skeptics might wonder why well-known landmarks like Mount Everest, the highest mountain in the world, didn't make the list. Video clip of Angel Falls from David Attenborough's BBC series "Planet Earth"
Tenemos que apoyar a Venezuela y salto angel. Es el lugar mas bello del mundo, espectacular, misterioso, maravilloso y sobre todo, nuestro. Gracias. Un millon. Eres un hermano de alma, un "chamo" adoptivo de Venezuela. Vanessa.